Has anybody using 88AKI/92RON gasoline tried to look at the ignition timing at idling speed? Also, for people using 94AKI/98RON grade? I am interested to know if the timing advance is the same. We have 87/89/91AKI here in AZ, and it does advance the timing for 91, though I don't think it's a whole lot. I do actually get better economy on 91. I'll have to datalog those points specifically and report back. What points are you looking for? Timing, MAF/MAP, RPM? 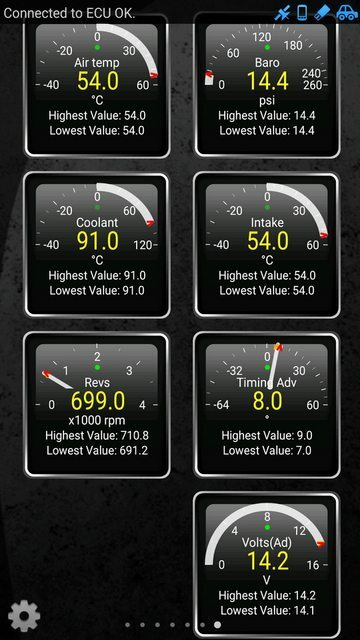 That's because it is I've used both apps and I prefer OBDLink over Torque, but they both have their pros and cons. I'm not familiar with Torque, but OBDLink has a configurable logging function. It would be easy to pick criteria and capture data. Let's define the data set for this experiment. I'll be happy to contribute. Doesn't look like I'm very different from what you got, Mitz. 740RPM @ 194F (90C), 8 degrees. I'll switch back to 87AKI and pull the same numbers to see if it's any different. I should've checked the MAP as well, I'm curious to know if I actually made a difference by replacing the intake with a shorter run of 2" pipe and a K&N filter. I know the IATs change a lot quicker now from it.